We enjoyed our trip down the Russian River. Although it was billed as a full day trip up to 7 hours, we took about 3.5 hours to complete it. Since we canoed on a weekday and it was over 100 degrees outside, there were not many people on the river - which made for a very peaceful, scenic canoe trip! We packed our own lunch and drinks in a cooler and the site provided dry bags for our personal belongings. We needed a phone on the trip as you call when you are about 30-45 minutes from the end of the trip large rock standing in the middle of the river to arrange for pickup which was prompt! There are 2 trips you can take. Full and half day, 3-4 hours to 5-6 hours. The boats were good except for the seats, too hard! The trips was nice for a float trip, we went early August, and not much fast water. which is nine miles, was 2-3 miles too long. I think the half day would have been better. They gave good instruction before the trip for everyone and tips on turning the boats. shallow for the boat and you had to get out and pull for a few feet, but not a big problem. Pretty river to float down and everyone seemed to be having fun. My real only complaint about the trip was the ride back in this old dirty van. The young girl who checked us in for the trip was also our driver coming back. You sit sideways on benches and no one I saw could find a seat belt. for the van and the roads. The ride was pretty quiet excepts for the prayers being said. There was nowhere to put any bags or coolers so you had to drag them into the van with you. Overall a good trip except for the ride back! When we arrived to check in at Russian River Adventures, they had no record of our reservation. This was extremely surprising as I had the confirmation from Viator as well as the voucher. Luckily, the staff at RRA was very friendly and accommodating. They quickly made arrangements with an off-duty staff member so that we could take our trip. I am disappointed with Viator and will not use the service again. Fantastic! We did not know dogs weren't allowed for the half day trip and had just driven 2 hours. The owner was so kind. He offered to babysit our 90pnd lab so our family could still enjoy the day! The boats were clean. Very informative instruction before setting out as far as safety. We had a blast! Definitely planning another trip! We had a wonderful time. 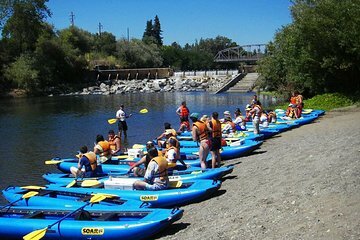 When we started out, there were so many people, that we were worried we would not have a nature experience, but within the first half hour, the group dispersed, and we were paddling along in the silence of the river. Friendly staff and great experience for our family of 4! Always a fun option with a bunch of friends. We bought sandwiches and beer and floated for a few hours on the half-day option. would totally do again! Really easy trip. We were able to have one adult and two kids per boat, which was great for me and my friend. We were doing it to celebrate summer with our recent graduates (from 2nd, 3rd, and 5th grades.) The staff was very helpful and the trip had tiny fast parts to make us feel triumphant! 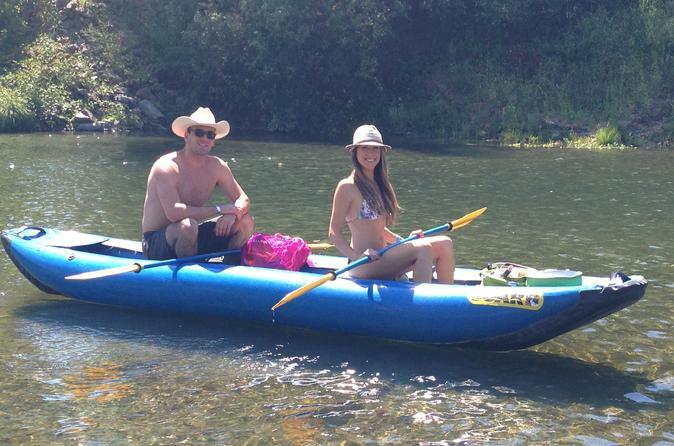 This canoe trip from Healdsburg was so much fun! From the moment you park there are people ready and willing to help you with your bags and point out where to check in, all with a smile and some jokes (helpful on an early morning trip). The canoes are great, though at times a bit tiring to paddle, and have plenty of room for several bags and a cooler - the cooler is a must. We had a blast switching off between paddling, drinking wine, and hanging out with our fellow canoers. The weather was overcast at first, but when the sun broke through we ditched our sweaters for bathing suits and took plenty of breaks to just float and soak up some sun. Would definitely recommend this canoe trip! I had so much fun! I'm not an outdoorsy-type but it was a blast. Calm water with tiny pockets of faster currents to keep it interesting. The instructor gave good tips on the best way to navigate the river, how to steer, paddle etc. He also gave tips on good places to go ashore and climb out for some swimming--so bring a swimsuit. The water is refreshing; I wish I had thought to wear one. You don't have to be an Olympic rower to enjoy this tour. I'm was a miserable but enthusiastic captain and while our boat did donuts in the water and ran aground into bushes and rocks, we were having fun and constantly laughing. There's a little shop before you set out in case you forgot your sunscreen or hat (so recommended). Also, wear your flip-flops for sloshing around in the water.